For each event, you can charge extra for optional benefits or activities. For example, you could offer preferred seating or discounted concert tickets. The charges for these options would be in addition to the registration fee. You can also add extra charges that are calculated using a value entered by the registrant. For example, you could add an option to purchase a specific of items, or charge a variable event surcharge based on organization size or income. To provide optional extras at a separate cost for an event, you add custom event fields to the event registration form. Event fields are combined with common fields from your contact database to form the event record and populate the registration form. There are two types of extra cost fields: static fields which provide options that registrants simply choose, and calculated extra charge fields which display an input field whose value is used to calculate the actual charge. Static fields provide options that a registrant can choose or choose from, such as preferred seating or meal choice. Within the events list, click the event. Click the Registration form link. A set of checkboxes, each with an associated cost. Choose this type if you want to allow the registrant to make multiple selections. A set of mutually exclusive choices, arranged like buttons on a car radio, each with an associated cost. Choose this type if you want to allow the registrant to make a single choice from multiple options. In the Field label box, enter a name for the field. The name will appear as the label for the field on the event registration form. 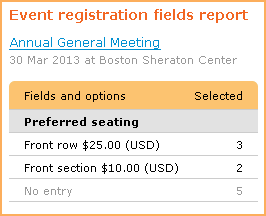 Under Items, choose the options to be displayed for this field on the event registration form, and specify the costs of each. Click Add new item to add items to the list. Click the minus sign beside an existing option to change or remove it. If you want an option to appear already selected on the form – to be checked by default – click the checkbox beside the item. You can add calculated extra cost fields that calculate an extra charge using a value entered by the registrant. For example, you could add an option to purchase a specific of items, or charge a variable event surcharge based on organization size or income. 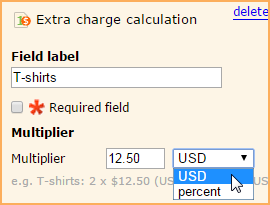 Under Type, choose Extra charge calculation . Click the event within the events list. 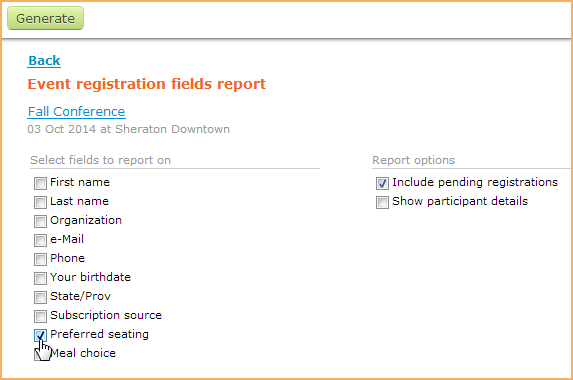 Within the event details, click the Registration fields report button. Select the registration fields to be reported on, and indicate whether to include pending registrations and show attendees details. If you chose to show attendee details, the report will display the name, email, and registration status for the registrants for each choice.